Multiplate® ASPItest is a reagent kit used for monitoring of Aspirin® and other cycloxygenase inhibitors in routine platelet aggregation studies for the evaluation of normal platelet function on the Multiplate® Analyzer. 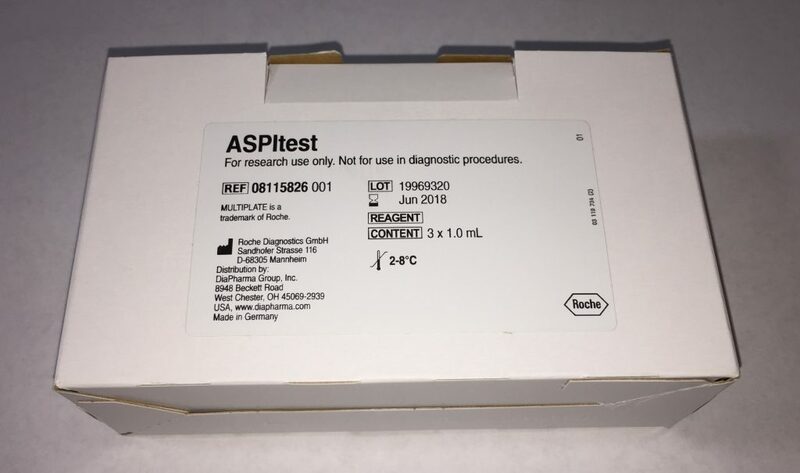 The ASPItest reagent is a lyophilized preparation of arachidonic acid (AA), stock concentration 15 mM. Please note the catalog # for Multiplate® ASPItest has changed to 08115826001. You may have previously ordered this under catalog #s MP0210 or 06675816190. 08115826001: Multiplate® ASPItest reagent, Kit, 3 x 1.0 ml. 150 tests. Stable until the expiration date printed on the vial label when stored at 2-8°C. 06675662190: Multiplate® ASPItest Aliquot Vials, Bag, 100 color coded micro test tubes for aliquotation. MP0110: Multiplate® ASPItest reagent, Bag, 1 x 1.0 ml, 5 color coded micro test tubes for aliquotation. 50 tests. In the ASPItest, platelets are activated by arachidonic acid, which is converted by the platelet cyclooxygenase enzyme (COX-1) to the potent platelet agonist thromboxane A2. Arachidonic acid alone is not a platelet agonist and is the physiological substrate of the platelet COX-1. Therefore, platelet activation in the ASPItest allows a very sensitive and specific detection of Aspirin® action.